Experts believe that the high pressure system is going to bring extreme temperatures to the western U.S. this weekend. Places known for dry heat and hot summer days could hit record-breaking highs. The notoriously hot Death Valley may reach temperatures up to 129°F, only five degrees below the world-record high recorded July 10, 1913. The National Weather Service forecasts that Utah will reach at least 110 degrees, and that western Washington, the rainiest state in the country, should break the 90s early next week. The predicted record-setting and life-threatening heat wave is supposed to suspend Phoenix, Ariz. and Las Vegas, Nev., temperatures in the highs of 115°F and 120°F all weekend. Officials in Arizona have already warned residents to take precaution if they have to go outside and to pay attention to critical warning signs of danger. "If you get dizzy or light-headed, those are some signs of dehydration. If you become confused, that's a real warning sign," said the University of Arizona Department of Emergency Medicine, Dr. Kevin Reilly to Tucson station KVOA. The National Weather Service warns of the dangers of heat stroke and how deadly such high temperatures can be. According to WebMD, heat stroke, also known as sun stroke, is considered the most serious form of heat injury. It can lead to brain or internal organ damage, and when medical help is not administered immediately, it can be fatal. Heat cramps, fainting, dehydration, and heat exhaustion are the first steps toward experiencing a heat stroke, which can bring up core body temperatures to greater than 105°F. Common symptoms to monitor before it's too late include nausea, seizures, disorientation, headaches, muscle weakness, and lack of sweating, despite the heat. Infants, children, the elderly, and those with chronic medical conditions such as kidney disease, asthma, hypertension, and diabetes are at a higher risk for heat-related illness and should remain indoors with an air-condition and access to cool fluids. If it does get too hot and a person needs help, certain cooling strategies can bring temperatures down to a reasonably safe level. Fanning air over the person and wetting his or her skin with a wet sponge or garden hose can help prevent or treat a heat stroke. Applying ice packs to the person's armpits, groin, neck, and back is an important and successful treatment, as these areas are rich in blood vessels close to the skin. Immersing a person in a shower or bath of cool water will also bring temperatures down but should be done with caution as to not shock the person's body. The National Weather Service believes the heat wave along with its exceedingly hot temperatures is going to last through Monday, with very little relief at night. There is also a minimal chance of rain relief because the dome of heat will prevent clouds from forming. "This is the hottest time of the year but the temperatures that we'll be looking at for Friday through Sunday, they'll be toward the top. We'll be at or above record levels in the Phoenix area and throughout a lot of the southwestern United States," National Weather Service meteorologist, Mark O'Malley told the Associated Press. 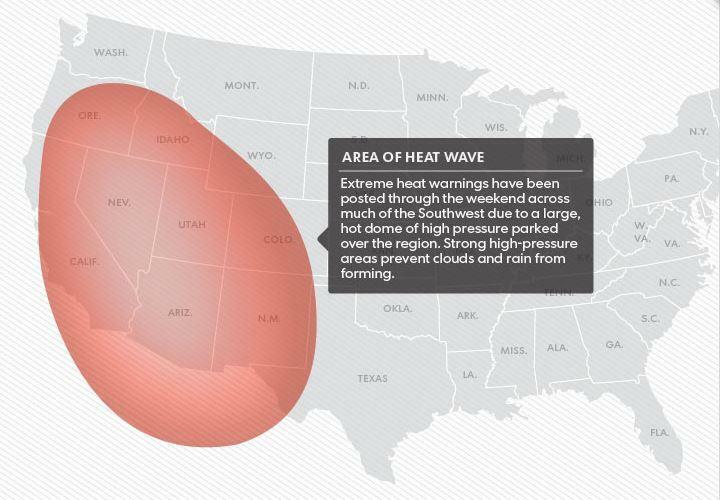 "It's going to be baking hot across much of the entire West." The northeast U.S. is experiencing an entirely opposite weather report, as more heavy rain is expected Friday and possibly through the weekend.